The barrel of the American benchmark for the sweet light crude oil has come under increasing selling pressure during Friday's session after Chinese Exports contracted nearly 21% on a year to February and Imports went down more than 5% on a yearly basis. The resulting trade surplus also came in on the weak side, narrowing to $4.12 billion from January’s $39.16 billion. The resulting trade surplus also came in on the weak side, narrowing to $4.12 billion from January’s $39.16 billion. These results sparked renewed concerns over the potential slowdown in the Chinese economy, regarded as the largest crude oil importer in the world. Today’s results add to the recent revision lower in China’s GDP for the next periods. However, Prices are back up erasing most of the losses as Saudi Arabia reconfirmed that OPEC and OPEC+ are sticking to their decision by voluntary production adjustments until the global market is re-balanced. 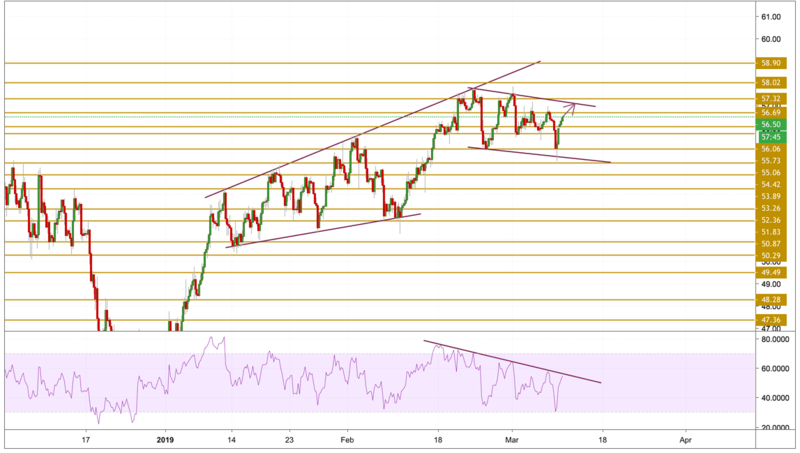 Crude oil prices remained relatively intact after slipping below the $55 level on Friday and then erasing back the losses after picking up some traction. The price is currently trading just below the stubborn $56.7 level with a bullish momentum. A break to the upside will most likely send the price towards the upper band presented on the chart and the next level to watch will be the $57.32 level.